In our column "Others about us" our intention was to present all the reactions to our work, no matter is it positive or one of those we are not very fond of (anti-Semitic attacks), all with purpose to show to the visitors how the public evaluates our actions. Most of the reactions we collected during past five years are from local newspaper reports. Our intention is to show, without editing or polishing, how Serbian media observe our activities. That is why we presented scans of newspaper pages showing published articles about us. On separate pages we published photo galleries showing anti-Semitic incidents, particularly those on territory of Zemun and in our community. Jelena Đurović from the JC Beograd and Nenad Fogel from the JC Zemun represented Serbia at this event. 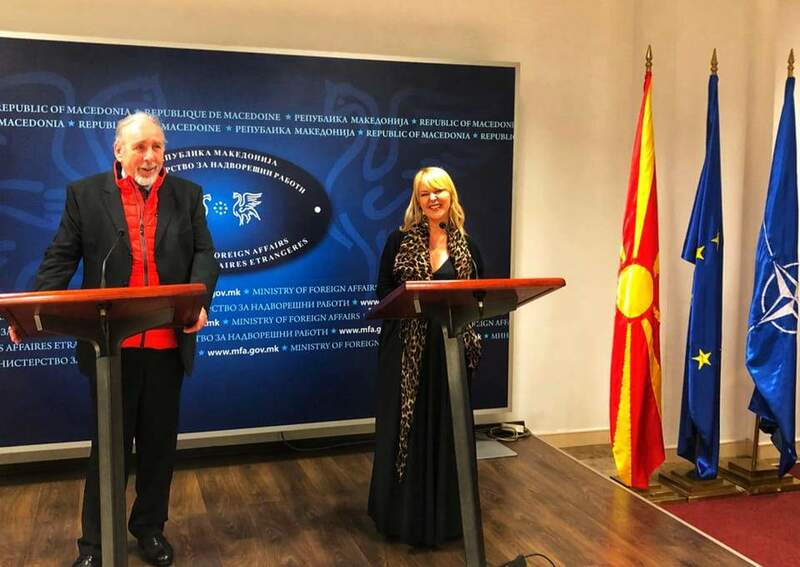 The security needs of Jewish communities were at the centre of discussion at a regional conference co-organized by the OSCE Office for Democratic Institutions and Human Rights (ODIHR) in Skopje on 12 and 13 November 2018. The conference, organized in co-operation with the Ministry of Foreign Affairs of the former Yugoslav Republic of Macedonia, the OSCE Mission to Skopje and the local Jewish community, was designed to raise awareness of and discuss ways to address the security needs of Jewish communities in the Western Balkans region. The event brought together more than 50 law enforcement officials and Jewish community representatives (35 men and 17 women) from the host country, as well as Albania, Bosnia and Herzegovina, Croatia, Montenegro, Serbia and Slovenia. Whole text at the OSCE site. Published on November 13, 2018. I am honoured to say a few words on the occasion of the opening of the exhibition on the concentration camp, the camp of death, of Jasenovac within the marking of International Holocaust Remembrance Day on 27 January, established by the United Nations to remember the day of the liberation of Auschwitz. This exhibition is aimed not only at informing the international public of a little known chapter of the Second World War; it is also aimed at warning of the dangerous attempts to revive the ideology and political practice that brought horror and atrocities. These attempts are in part exemplified by unscientific reinterpretations of the events and processes that took place during the Second World War that are becoming part of public discourse and justify crimes. It is our duty to fight these attempts at amnesia, which are a new crime and a call to commit it all over again. Whole text at the Ministry of Foreign Affairs site. Published on January 26, 2018. UNESCO'S new elected director-general France's Audrey Azoulay attends a press conference at the United Nations Educational, Scientific and Cultural Organisation, UNESCO headquarters in Paris, Friday, Nov. 10, 2017. UNESCO's member states have voted to confirm the nomination of former French Culture Minister Audrey Azoulay as the body's new leader. New UNESCO chief Audrey Azoulay has rebuked the U.S. for its decision to withdraw from the U.N. cultural body for alleged anti-Israel bias and says America is "affected by everything" the agency does. Whole text at the McClatchy site. Published on November 10, 2017. The technology that binds all of these other systems together is the Israeli soldier. Since 1948 (and even before) Israel has committed the best of its human capital to the armed forces. The creation of fantastic soldiers, sailors, and airmen doesn’t happen by accident, and doesn’t result simply from the enthusiasm and competence of the recruits. The IDF has developed systems of recruitment, training, and retention that allow it to field some of the most competent, capable soldiers in the world. None of the technologies above work unless they have smart, dedicated, well-trained operators to make them function at their fullest potential. Whole text at the Yahoo News site. Published on October 22, 2017. The U.N. Human Rights Council’s perennial debate focusing on condemning Israel witnessed an unusual intervention Monday – a strong-worded statement in Arabic-accented English slamming not Israel but the Palestinian Authority. Whole text at the CNS News site. Published on September 25, 2017. In UN General Assembly Speeches, Palestinian and Iranian Leaders Savage Israel and Zionism. Attacks on Israel’s legitimacy were in full flow at the UN General Assembly session in New York City on Wednesday, as Palestinian Authority President Mahmoud Abbas denounced the 1917 Balfour Declaration — in which Britain announced its support for “the establishment in Palestine of a national home for the Jewish people” — as a “crime against our people,” while Iranian President Hassan Rouhani described the Jewish state as “the rogue Zionist regime,” in language harking back to the “Zionism-is-racism” days at the world body during the 1970s. Whole text at the WIN site. Published on September 23, 2017. Earlier this month, Google and GoDaddy booted the Daily Stormer, another neo-Nazi and white supremacist site. Stormfront was no longer available online after its host put a hold on the neo-Nazi and white supremacist website. The hold issued Friday by Network Solutions is “uncommon” and “usually enacted during legal disputes, non-payment, or when your domain is subject to deletion,” said the Internet Corporation for Assigned Names and Numbers, according to Salon. Whole text at the jpost.com. Published on August 26, 2017. The council also said any changes to make the building safer would also make it an eyesore. A local council in Australia has prevented the construction of a new synagogue due to fears that it could be a terror target, news.com.au reported on Thursday. The new place of worship was planned for a site just hundreds of meters from the country's iconic Bondi Beach. The decision was upheld by the Land and Environment Court, which appeared to use the proposal's own risk assessment to determine that the synagogue could be a target and therefore endanger the lives of worshipers and local residents. However the council also said that any changes to make the building safer would be unacceptable as they would have too great an environmental and aesthetic impact on the neighborhood. Whole text at the i24.com. Published on August 3, 2017. Whole text at the Observer.com. Published on July 7, 2017. Facebook will not block Holocaust-denying content on its platform in countries where it remains legal, saying it is merely the expression of an opinion. Facebook will continue to allow Holocaust-denying content on its platform in countries where Holocaust denial is legal, a Facebook executive announced. Israel’s NRG news reported Monday that Facebook’s head of policy in Israel, Jordana Cutler, in a letter to Member of Knesset (MK) Uri Maklev, wrote that Holocaust denial is illegal in Israel, and therefore such content is blocked for Israeli users as well as in other countries where it is illegal. However, where Holocaust denial is permitted, the social media platform will not block the content. Whole text at the worldisraelnews.com. Published on June 26, 2017. Elected officials joined thousands of marchers in a sea of blue and white flags along New York City's Fifth Avenue for the annual Celebrate Israel parade. Participants ranging from school-age children to adults came out Sunday under overcast skies for the event. Elected officials who marched included New York Gov. Andrew Cuomo and New York City Mayor Bill de Blasio, as well as Sen. Charles Schumer. Former New York Giants running back Tiki Barber was an honorary grand marshal. The event was formerly known as the Salute to Israel Parade, and marks the birth of the Jewish state in 1948. The thousands of people who take part include students from regional yeshivas and Jewish day schools, Jewish groups and synagogues. Whole text at the ABC News site. Published on June 4, 2017. Russia’s Foreign Ministry shocks the world by declaring West Jerusalem to be the capital of Israel. In a statement released today by its Foreign Ministry on the Palestinian-Israeli conflict, Russia took the unusual step of removing ambiguity about its stance on West Jerusalem. After explaining that it is “deeply concerned” about the absence of active negotiations between Israel and the Arabs on the creation of an Arab state in Judea and Samaria, Russia spelled out its stance on Jerusalem. Whole text at the WIN site. Published on April 6, 2017. A program to provide direct funds to Serbian Holocaust survivors all over the world has been launched in Serbia, an international Jewish group said Tuesday. The program results from a law passed last year in Serbia allowing for the restitution to the Jewish community of heirless and unclaimed Jewish property seized during the Holocaust, the World Jewish Restitution Organization said in a statement. Tens of thousands of Serbian Jews perished during Nazi occupation of the Balkan country during World War II. The law envisions the Serbian government paying 950,000 euros ($1 million) per year for 25 years to the Federation of Jewish Communities. For at least the first 10 years, one-fifth of the money will be set aside for direct payments to Holocaust survivors, the World Jewish Restitution Organization said. "This is a historic step to provide compassion and a measure of justice to Serbian Holocaust survivors more than 70 years after the Nazis declared Serbia free of Jews," WJRO Chair of Operations Gideon Taylor said. Whole text at the Charlotte Observer site. Published on April 5, 2017. “In the Torah, Jerusalem is the capital of King David, where Solomon built the Temple and placed the Ark of the Covenant,” UNESCO Director-General Irina Bokova said, firmly rebuffing any attempts by her organization to deny Jewish history connected to Jerusalem. Bokova was speaking at the policy conference of the European Coalition for Israel, a Christian grassroots movement, in the European Parliament on Thursday. Distinguishing between her role as the highest official of UNESCO and the resolutions passed by member states of the same organization, she said the protection of the heritage of Jerusalem is part of a broader vision for peace and the fight against all forms of denial of Jewish history, delegitimization of Israel and antisemitism. Whole text at the Jerusalem Post site. Published on April 5, 2017. The United States on Monday boycotted a Human Rights Council session focusing on Palestinian areas, saying the regular review shows the council's "long-standing bias against Israel" that threatens the credibility of the U.N.-supported body. Israel is the only country that faces an examination of its rights record at every one of the council's three sessions each year under a standing agenda item - known as Item 7 - on "Palestine and other occupied Arab territories." The current session, which lasts four weeks, ends Friday. U.S. ambassador to the United Nations Nikki Haley, in a statement, denounced how Israel was the only country that is a permanent fixture on the 47-member body's calendar. Whole text at the ABC News site. Published on March 20, 2017. Accused anti-Semitic bomb hoaxer Juan Thompson has a long history of ridiculous lies and frightening threats — everything from once boasting he got a Malcolm X tattoo to vowing to smear his rivals as “racists” and ruin their careers, according to people who count themselves as his victims. “He told me I wouldn’t get a job once he was done with me,” former friend and Vassar College classmate Ian D’Emilia told The Post. Thompson, a 31-year-old disgraced journalist, remained jailed on federal cyber-stalking charges Saturday for allegedly calling in eight bomb threats to Jewish organizations. Whole text at the New York Post site. Published on March 5, 2017. Israel’s Intelligence Minister said “all of Lebanon will be hit” after Hezbollah leader Nasrallah threatened to attack Israel’s nuclear facility in Dimona. “If Nasrallah dares to fire at the Israel homefront or at its national infrastrucuture, all of Lebanon will be hit,” Katz said in a statement. Katz made his remarks after Hezbollah’s Secretary-General Hassan Nasrallah implicitly threatened to attack Israel’s nuclear facility in Dimona, located in Israel’s Negev region. “I call upon Israel not only to evacuate the ammonia tank from Haifa, but also to dismantle the Dimona nuclear reactor,” Nasrallah said shortly after an ammonia tank up in Haifa was closed down earlier this week. Whole text at the WIN site. Published on February 17, 2017. Whole text at the NY PostNews. Published on December 30, 2016. This year, the start of Hanukkah was met with a spate of anti-Semitism, including an apparent attack at a California synagogue, and at a school in France that was defaced with graffiti in German declaring, “Jews prohibited.” Even President-elect Donald Trump was bombarded with anti-Semitic tweets after he sent good wishes to those celebrating the holiday. In the case of the California synagogue, Rabbi Boruch Rabinowitz arrived at the Living Torah Center Chabad in Santa Monica on Sunday morning to discover feces and rice smeared across the front window of the synagogue. Whole text at the Yahoo News. Published on December 27, 2016. Whole text at the United with Istael site. Published on December 3, 2016. Ami Horowitz went on a fact-finding mission to Sweden to see how much the tide of Muslim immigration has harmed the Scandinavian country. He highlights the extreme rise in rapes and violence, and shows areas that police will not go into. While in one of these areas, Horowitz got attacked by five men and can be heard yelling for help. He asks people to consider whether Sweden has simply offered too many social benefits to anyone living within their borders, and has made it too welcoming for immigrants. This video makes you wonder when Sweden and other European nations will hit their breaking point. Video at the PJ Media site. Published on December 16, 2016. While many Ukrainian politicians and political activists alike have embraced pointed views on their country’s thorny and controversial World War II past, relatively few may claim direct personal experience of the Holocaust. Abraham Kristein, however, is the rare exception of someone who not only witnessed horrific wartime atrocities in Soviet Ukraine but also lived to tell the tale. Now 84 years old, he soberly recounts his harrowing story over lunch at a local synagogue located in Podil, Kyiv’s old Jewish historic quarter. Whole text at the Huffingtonpost. Published on December 3, 2016. A smiling, playful and yet poignant ice skating performance on Russian national television has created a social media firestorm — because it is holocaust-themed. Tatyana Navka, a famous champion ice skater in Russia and the wife of Vladimir Putin’s press spokesman Dmitry Peskov, did a holocaust themed skating performance Saturday on Russia’s “Dancing With the Stars” equivilant, “Ice Age” pairing with famous actor Andrey Burkovskiy. Navka took to Instagram, calling it “one of my favorite performances,” but her followers thought something quite different. Video at the Yahoo News. Published on November 27, 2016. Whole text at the CNS News. Published on November 14, 2016. Roger Waters is planning his most spectacular and expensive tour yet — but the Pink Floyd legend is facing backlash from some big-name sponsors over his views on Israel. Sources tell us that American Express balked at spending up to $4 million to sponsor Waters’ 2017 US + Them North American tour. AmEx sponsored this month’s so-called “Oldchella,” the Desert Trip festival, where Waters performed along with the Rolling Stones, Paul McCartney, Bob Dylan and Neil Young. Whole text at the Fox News. Published on October 28, 2016. Philippine President Rodrigo Duterte visited a synagogue in the Manila metropolis Tuesday to personally apologize to the Jewish community for making a "terribly wrong" comparison between his anti-drug campaign and Hitler and the Holocaust in a recent speech. Duterte had apologized to the Jewish world in a speech Sunday but he visited the Beit Yaacov synagogue in Makati city to press his expression of regret and assure that he was not racist, adding that his wife, now separated from him, has Jewish ties. "I would like to apologize and it comes from the heart," Duterte told members of the Jewish Association of the Philippines. Whole text at the Miami Herald site. Published on October 4, 2016. Renowned for his decades-long quest for peace in the Middle East, Shimon Peres’s greatest triumph was his cunning and successful plan to bring nuclear weapons to Israel. PARIS —Shimon Peres is recognized as a great statesman and will be remembered after his death early Wednesday morning at age 93 as a passionate advocate of peace between Israel’s Jews and the Arabs of the Middle East. Whole text at the Daily Beast site. Published on Sep 28, 2016. Rio de Janeiro (AFP) - Egyptian judoka Islam El Shehaby was jeered out of the Olympic arena in Rio on Friday after refusing to shake hands with his Israeli opponent. El Shehaby was beaten by Or Sasson in their heavyweight first round encounter but at the end of the bout, he refused to either bow to the Israeli or shake his hand. In judo it is customary to both bow to opponents -- a sign of respect in Japan -- and shake hands after a bout is over. El Shehaby had been well beaten but stood impassively as Sasson tried to shake his hand. As he left the mat area, El Shehaby was called back to the centre by the referee to bow. Whole text at the Yahoo News site. Published on Aug 12, 2016. Amsterdam will give €10 million to its Jewish community as compensation for imposing housing taxes on Jewish survivors of the Second World War who returned home from concentration camps. Jewish people who returned to Amsterdam after the war were charged "ground rent" arrears, plus a penalty, for the period their home was unoccupied. Some homes had been sold in their absence. The local government at the time also charged outstanding street taxes and insurance bills to the Jewish owners or their surviving relatives, according to a Dutch institute for war, holocaust and genocide report. The payments first came to light in a 2013 study by student Charlotte van den Berg. Eberhard van der Lann, the mayor of Amsterdam, told a council meeting the same year they should “recognise what went wrong and put it right”. Whole text at the Telegraph site. Published on May 20, 2016. Satirical filmmaker Ami Horowitz went to Portland State University and asked people on campus if they would help raise money for Hamas. Horowitz said he wanted to see just how far America's liberal students in the Pacific Northwest were willing to take the BDS Movement (Boycott, Divestment and Sanctions) against Israel. Video at the Fox News Insider site. Published on May 23, 2016. The new government includes an outspoken apologist for the country's World War II-era fascist regime. The European Union’s newest member, Croatia, has an unabashed and strong-willed fascist in its new cabinet — one who makes the right-wingers in power in Hungary and Poland look like wimps. The contested figure is Zlatko Hasanbegovic, a 42-year-old historian who became culture minister in late January after the country’s latest election produced a new right-wing ruling coalition. Whole text at the foreignpolicy.com site. Published on May 6, 2016. A 94-year-old former Auschwitz guard on trial in Germany apologised in court to victims on Friday, telling them he regretted being part of a "criminal organisation" that had killed so many people and caused such suffering. "I'm ashamed that I knowingly let injustice happen and did nothing to oppose it", said Reinhold Hanning, a former Nazi SS officer, seated in a wheelchair in the court in Detmold. Hanning is charged with being an accessory to the murder of at least 170,000 people. Holocaust survivors, who detailed their horrific experiences at the trial which opened in February, have pleaded with the accused to break his silence in what could be one of the last Holocaust court cases in Germany. Hanning finally broke the silence he kept over the course of 12 hearings, each limited to two hours due to his old age. Reading in a firm voice from a paper he took out of his grey suit pocket, he said: "I want to tell you that I deeply regret having been part of a criminal organisation that is responsible for the death of many innocent people, for the destruction of countless families, for misery, torment and suffering on the side of the victims and their relatives". Whole text at the Reuters site. Published on April 29, 2016. Israeli Prime Minister Benjamin Netanyahu’s bold claim to Syria’s Golan Heights, annexed by Israel in 1967, was rejected by the U.N. Security Council, which still regards the land as belonging to Syria. The dispute over the heights, which are situated on the Syrian-Israeli border and which Tel-Aviv has argued are strategically important for national security, has been ongoing for decades. A 1981 U.N. resolution officially dismissed Israel’s established control of the heights as illegitimate and a slow resolution process ensued, seeking to restore Syrian control over the territory. Whole text at the Newsweek site. Published on April 27, 2016. TEHRAN, IRAN— Iran's President Hassan Rouhani on Sunday vowed to defend Muslim countries against terrorism and Israel while insisting that its neighbors should not feel threatened. Speaking during a National Army Day parade in which Iranian forces displayed sophisticated air defense systems recently acquired from Russia, Rouhani praised Tehran's role in helping the Syrian and Iraqi governments roll back the Islamic State group. Whole text at the VOA site. Published on April 17, 2016. New York (AFP) - When Bernie Sanders called Israel's response in the 2014 Gaza war disproportionate and urged America to be more balanced on the Israeli-Palestinian conflict, he smashed a presidential campaign taboo. His remarks at the April 14 Democratic debate ahead of New York's decisive primary on Tuesday amounted to unprecedented criticism of Israel and promotion of Palestinian rights from a canvassing US presidential candidate. Israeli Prime Minister Benjamin Netanyahu "is not right all of the time," said the Vermont senator. "We cannot continue to be one-sided." He criticized Democratic frontrunner Hillary Clinton for not saying that she would do more to promote Palestinian rights when she addressed the powerful right-wing American Israel Public Affairs Committee (AIPAC) lobby in Washington in March. Whole text at the Yahoo News site. Published on April 17, 2016. Former French far-right leader Jean-Marie Le Pen has been fined 30,000 euros (£24,000; $34,000) for calling the Nazi gas chambers a "detail" of World War Two. He was convicted of contesting crimes against humanity. The former Front National chief was convicted of the same charge in 2012 after saying France's Nazi occupation had been "not particularly inhumane". France has strict laws against Holocaust denial. Mr Le Pen told a journalist his remarks "corresponded to my thought that the gas chambers were a detail of the history of war". Whole text at the BBC site. Published on April 6, 2016. Jerusalem-The Simon Wiesenthal Center today called for sanctions to be leveled against Croatian football supporters in the wake of numerous fascist and anti-Semitic chants by local fans at the Israeli-Croatian friendly match held in Osijek, Croatia last Wednesday. Whole text at the SWC site. Published on March 28, 2016. Approximately five miles south of Chicago’s O’Hare International Airport, alongside the Interstate 294, stands a large anti-Israel billboard. Whole text at the Observer site. Published on Feb 19, 2016. Pope Francis made his first visit as pontiff to a synagogue on Sunday, where, in a reference to Islamist attacks, he condemned violence in the name of religion. Amid chanting of psalms in Hebrew and speeches underscoring the remarkable advances in Catholic-Jewish relations in the past 50 years, Francis became the third pontiff to visit Rome's main synagogue, after popes John Paul and Benedict. The temple is just across the Tiber River from the Vatican, and is rich with symbolism of the past persecution of Jews, who for nearly 300 years until the mid-19th century were forced to live in the adjoining quarter still known as The Ghetto and make compulsory payments to the popes. Whole text at the Reuters site. Published on Jan 16, 2016. STOCKHOLM - Swedish Foreign Minister Margot Wallstrom called on Tuesday for an investigation to determine if Israel was guilty of extrajudicial killings of Palestinians during the recent wave of violence there, local media reported. The comments were the latest in a series of statements by Wallstrom that have irked Israeli authorities. Ties between Sweden and Israel nose-dived after Sweden announced its recognition of a Palestinian state shortly after Wallstrom's center-left Social Democrats won general elections in 2014. She deepened the rift last year by describing Palestinians' plight as a factor leading to Islamist radicalization. Whole text at the Jerusalem Post site. Published on Jan 12, 2016. Stockholm (AFP) - The unusually frank approach of Sweden's foreign minister has seen fans send her flowers over her biting criticism of Saudi Arabia -- and now prompted Israel to declare her persona non grata. Declared unwelcome by authorities in the Jewish state on Wednesday thanks to a raft of critical comments, Margot Wallstrom has made a name for herself as a vocal feminist and fierce defender of human rights. The 61-year-old Social Democrat is the undisputed star of her government, but critics wonder whether her tendency to speak her mind -- not a quality traditionally found in diplomats -- is good for the country. Whole text at Yahoo.com. Published on Jan 15, 2016.